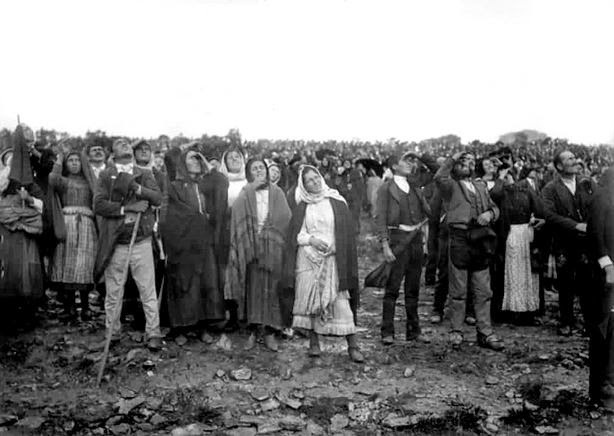 On October 13th over 70,000 people gathered around the site of the apparitions. People from different walks of life (including atheists who had gone to attack the children) witnessed what is now famously known as “The Miracle of the Sun.” During the Miracle of the Sun, the three shepherd children were witnessing what the Virgin had promised them in September. A cold rain had been falling throughout the night and into the day. Moved by an inner impulse, Lucia asked the people to shut their umbrellas and pray the Rosary. At noon, Our Lady appeared over the holm-oak she told Lucia several things. As Our Lady ascended up into the sky, Lucy shouted: “She’s going! She’s going! Look at the sun!” Then the miracle Our Lady had promised began. The sky cleared and the people could look at the sun without it hurting their eyes at all. Then the sun began to spin in place. Then it started to fall, plunging towards the earth. The sun became very large in the sky and very hot. It looked as if it was going to fall on top of the people and kill them all, as if it was the end of the world. So, the people fell on their knees in the mud and cried to God for mercy, begging Our Lady for Her help, Her intercession, and Her prayers. Suddenly, the sun stopped falling and went back up into the sky to its regular place. Then the people got up from their knees and they all began to notice that their clothes were dry and clean. Not only that, but many sick persons were cured that day — the blind were able to see and the lame could walk. Many sinners were converted too. They stopped sinning and went to Confession, and then lived according to God’s Commandments. Our Lady having disappeared in the immensity of the firmament, we saw, beside the sun, St. Joseph with the Child Jesus and Our Lady clothed in white with a blue mantle. St. Joseph and the Child Jesus appeared to bless the world, for they traced the Sign of the Cross with their hands. Here we have St. Joseph, no words are spoken by him, but rather we have his actions. St. Joseph, holding his son Jesus, blesses the world by tracing the Sign of the Cross with his hand. By giving his special blessing to the world, St. Joseph shows us that he is still vigilant in his role as Patron of the Catholic Church (as proclaimed in 1870 by Bl. Pius IX) and still keeps watch over the faithful entrusted to his care. Popes Pius XII, Paul VI, John Paul II and Benedict XVI all accepted the supernatural origin of the Fátima. The local bishop declared that (1) the visions of the three children are credible and (2) the veneration of the Blessed Virgin is permitted, the Portuguese bishops approved and declared the genuine supernatural nature of the event. The Vatican responded with granting indulgences and permitting special Liturgies of the Mass to be celebrated in Fátima. It does not end here we are continually called by Our Lady to PRAY the ROSARY daily, make sacrifices and go to confession. Only in this way will Jesus bring His Peace and stop the evils in the world today. As promised by Our Lady, God soon took Francisco and Jacinta to Heaven. Francisco died on April 4, 1919 and Jacinta on February 20, 1920. 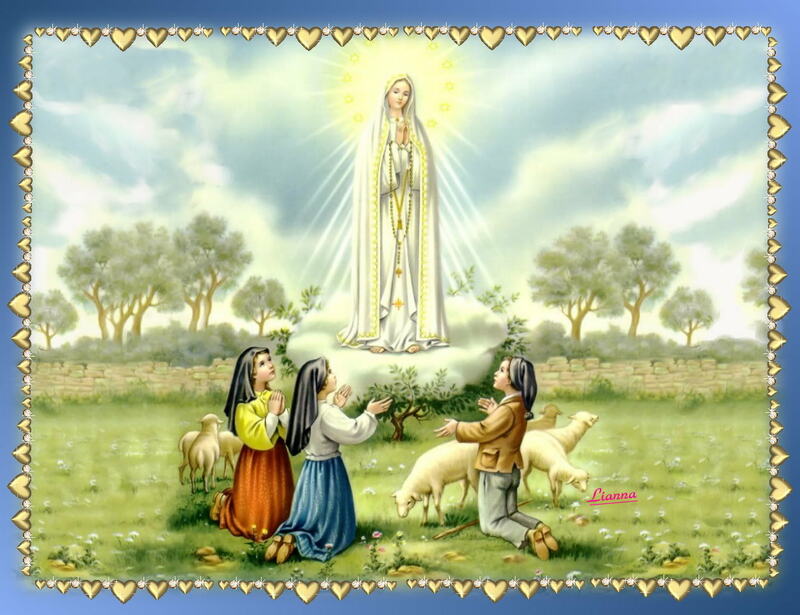 Lucia was left here on earth to tell everyone about Fatima. She was to make our Lady known and loved, and to spread devotion to Her Immaculate Heart.